Alfalfa is really a member of the pea family, making it a legume. It is indeed a remarkable plant as it can be planted anywhere in the world, at any time of the year, regardless of temperature and climate and it harvests in only 7 days. Perhaps our Creator is making this highly nutritive food easily available to us? Alfalfa sprouts derived from alfalfa seeds. They are white and thread-like, with tiny green tops. Its juice tastes mild and can be easily mixed with any other juices. Alfalfa sprouts are usually hydroponically grown so is pesticide-free. Alfalfa sprouts juice contains a myriad of valuable nutrients such as calcium, folate, magnesium, manganese, molybdenum, phosphorus, potassium, silicon, sodium, zinc. 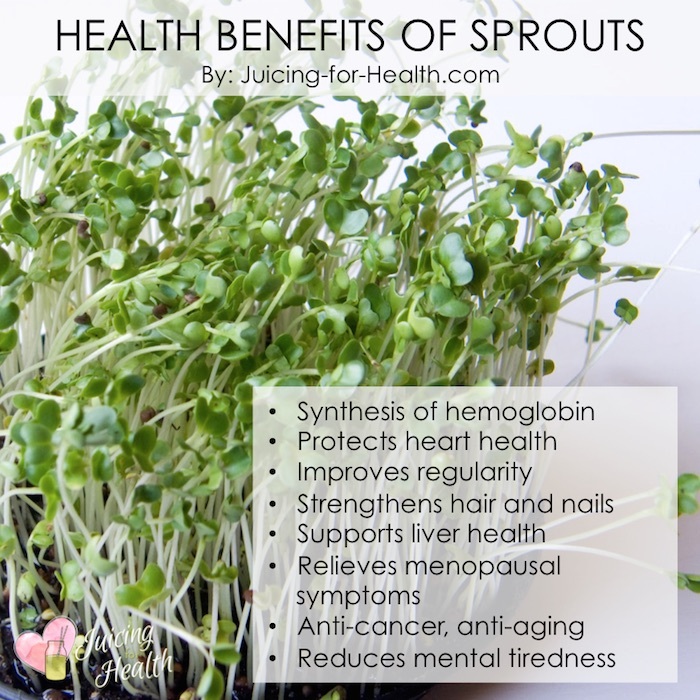 This is the only plant that supplies the full range of vitamins, from vitamin A, B complex (even B12), C, E to K. Alfalfa sprouts placed in indirect sun for a couple of days before harvesting, even produce nutritious blood-healing chlorophyll. 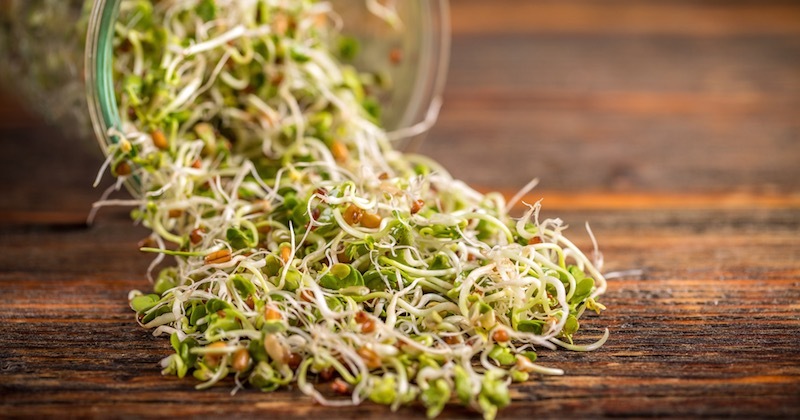 The wide range and high concentration of so many compounds present in alfalfa sprouts make this plant highly nutritive. Remember I talked about the amazing power of synergy? Antioxidant rich: Alfalfa sprouts is the top source of antioxidant among all vegetables. By drinking this juice regularly, it could prevent untold number of degenerative diseases. Some examples are heart disease, menopausal symptoms, osteoporosis and even cancer. Arthritis: A compound in alfalfa sprouts inhibits inflammation, making this plant highly beneficial for arthritis sufferers. High blood pressure: Eat your way out of high-blood pressure with this plant that contains something magical that helps lower blood pressure. Immune booster: Drinking alfalfa sprouts juice regularly will greatly boost your immune function as it increases the activity of your natural killer cells. Leukemia: Recent studies also suggested that an amino-acid called L-canavanine, may be a natural agent that is effective to fight leukemia. Lower LDL (bad) cholesterol: The active components in alfalfa have been tested to lower LDL cholesterol accumulation in the liver. Short-sightedness: A study shows that this juice may also be responsible in the treatment of short-sightedness. Ulcers of the intestine: This highly nutritive juice is also very gentle and healing for patients with ulcers in the intestine. Alfalfa sprouts are easily available nowadays at most health or vegetarian stores and the food section in supermarkets. They usually come in a small square, clear plastic containers in which they were grown. Buy only sprouts that have been kept at refrigerator temperature. Choose sprouts that are crisp, clean, moist and has no sign of yellowing or rotting. Refrigerated, it can keep for four to five days, but the “eat fresh” principle applies. Try not to keep them for too long. The good thing that came out of the salmonella bacteria contamination is that, it teaches us never to take hygiene for granted. Rinse your alfalfa sprouts thoroughly with water before juicing. Individuals who have or are at risk for systemic lupus erythematosus (SLE) should avoid or limit alfalfa consumption. Alfalfa sprouts contain an amino acid called L-canavanine that can send your immune system into overdrive and flare up your lupus symptoms. No matter how good anything is, remember moderation always. Never overdo by overdosing.